* See What's New for information on the new features and differences of v5. 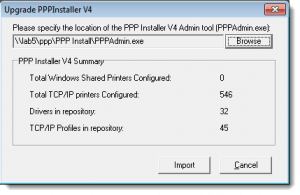 Install Printer Installer v5 or newer. Log in to the Printer Installer Administrator. Click the Tools menu, select Import, Printer Installer Version 4. The Printer Installer Import dialog will open. Browse to the location of your PPPAdmin.exe and select the PPPAdmin.exe file. The data from the v4 installation will be read into the import program and displayed. 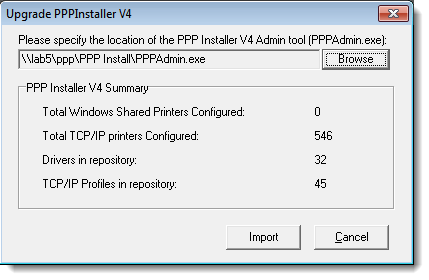 Printers that were installed on end user computers with Printer Installer v4 will be managed by Printer Installer v5+. As long as the associated driver or profile of a printer is not changed in the Administrator, the PI5+ client will not change the printers. If you make a change to the driver or profile, the new Administrator default settings will sync the changes to the end user computer.